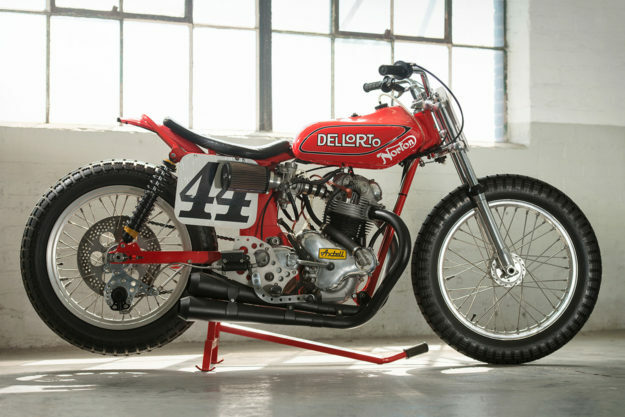 In the US right now, flat track is smokin’ hot. Indian has joined the fray and is giving Harley-Davidson serious competition. The Super Hooligan series, devised by Roland Sands and open to semi-production bikes, is picking up speed. 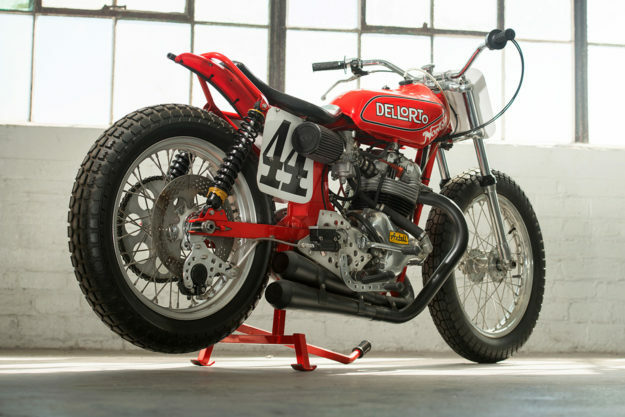 And custom builders the world over are looking to flat trackers for inspiration. If you’re one of those builders, you’ll find the biggest dose of inspiration right here. 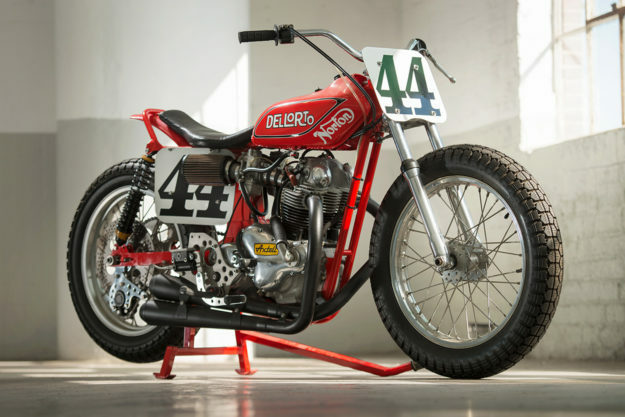 It’s the Ron Wood ‘lightweight’ Norton, owned by Jamie Waters, and the archetype of retro flat track style. 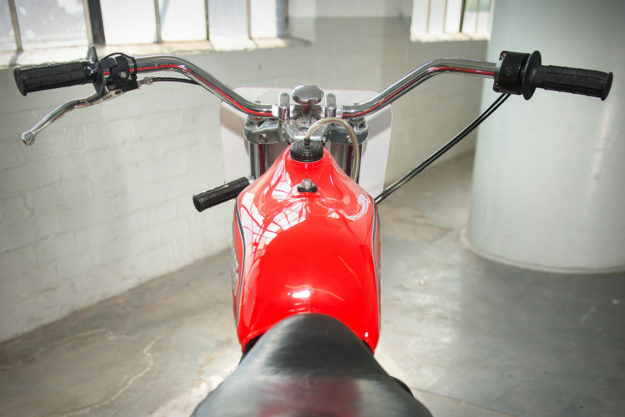 But back to the bike, beautifully captured for us by photographer Douglas MacRae. 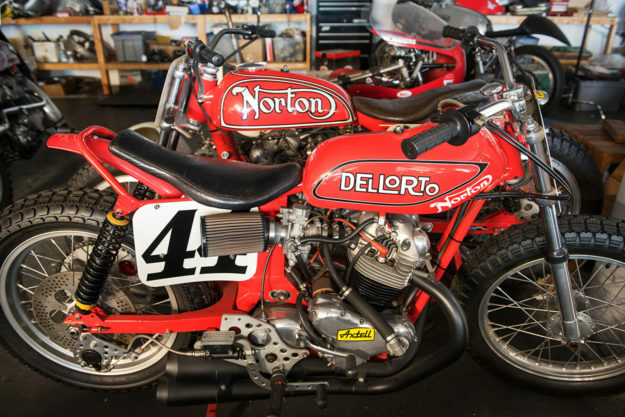 Anyone with a passing interest in flat track history will have heard of the legendary red ‘big tube’ Nortons. Ron Wood built the first one around 1971 or 1972, and the second a few years later. Around the same time, he constructed the National-winning ‘lightweight’ bike we’re looking at here—which has a single-backbone, dual down tube frame designed to (you guessed it) reduce weight. Jamie bought the lightweight from Ron directly, after they met at the Legend Of The Motorcycle show nearly ten years ago, where Jamie was showing his unrestored Ron Wood ‘big tube’ Norton. Although the Wood machines were not ‘factory’ bikes, they regularly beat Norton’s official entries, and his 1978 AMA National win was only the second ever by a Norton twin. 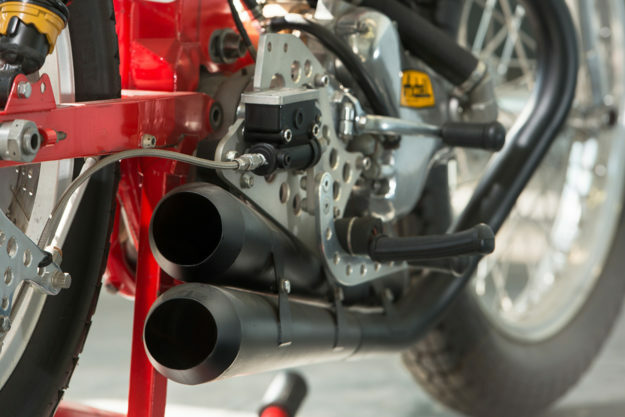 On the lightweight, Wood stuck with his preferred Ceriani forks-and-clamps setup, as widely used on flat track bikes of the period. The wheels are alloy 19″ Barnes units, and the exhaust system was made up by CR Axtell to complement his cam and cylinder head work. 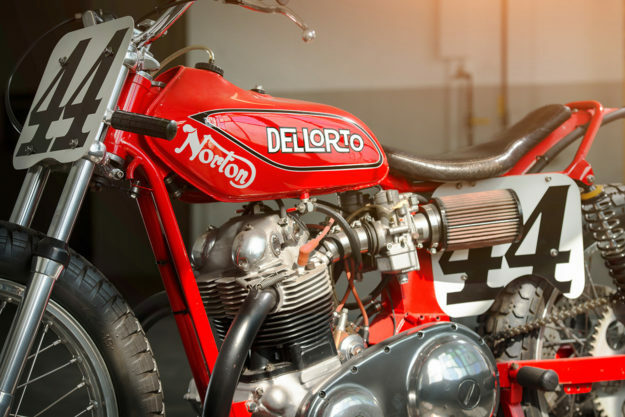 Although the two ‘big tube’ bikes used gas tanks from the Norton Hi-Rider Commando, the lightweight got its tank from a 1970s Yamaha DT. Wood’s Nortons were always down a few horsepower compared to the factory Harleys and Yamahas of the day. But he kept them competitive with skillful engineering—including an ability to transmit more of their power to the dirt than many other machines. By the second half of the 1970s, Wood needed an even lighter machine with a little more power. Enter the ‘lightweight,’ with a sub-270 pound weight—nearly 40 pounds less than Harley XRs of the day. 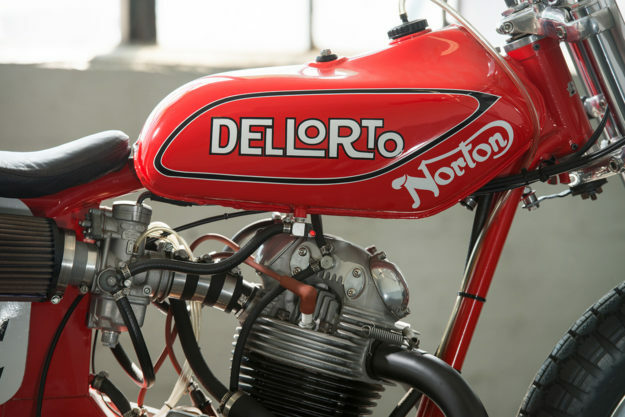 The carbs are 36mm Dell’Orto pumpers—hence the logo on the tank—and the pistons are Hepolites. In competition, these varied in compression between 9.5 and 10.5:1, with the lower compression being used for the longer mile races. The rods are standard Norton, and the crank is of one-piece construction. Power was up by six horses over the ‘big tube’ models—with 83 hp at 7,500 rpm at the rear wheel, thanks in part to a slightly shorter stroke in the engine. 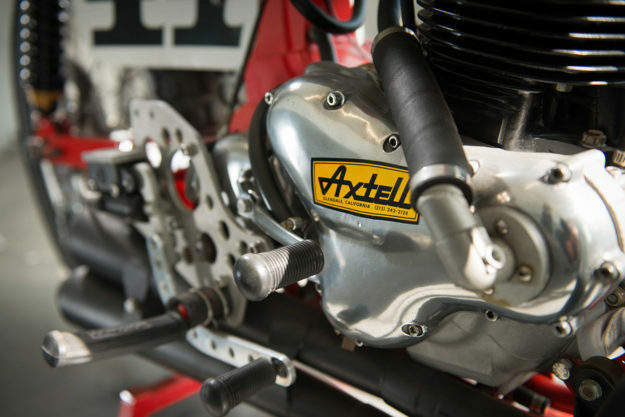 The mods worked, and in the hands of future AMA Hall of Famer Alex Jorgenson, the Ron Wood Norton won the AMA National at Ascot in 1978—making it the last Norton to win an AMA Grand National Flat Track event. The literal definition of “Looks good, goes fast,” isn’t it?